What a difference a cast makes. I tried to like the Doctor Who reboot but despite a reasonable liking of Chris Eccleston, Billie Piper is not a favorite and the cornball tone was a turn off. Recently, on a friend’s insistence that the show was worth watching, I took a peek at Season five. Ah! That’s the stuff! 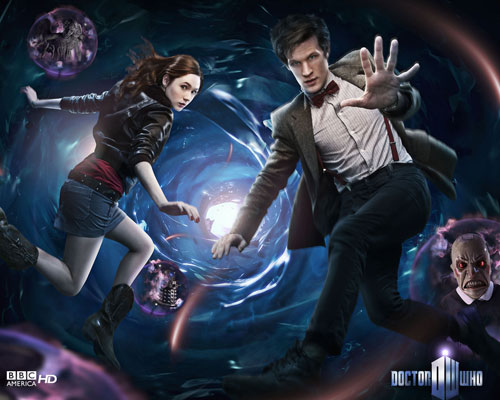 The redhead is charming and Matt Smith as the doctor? I’m not afraid to admit I’m smitten, head over heels for and totally crushing on him (a great jaw line and a bow tie are hard to resist). Thrilled to hear he’s signed on through 2014 at least. It’s not just Matt Smith that deserves mention though. The imaginative writing is excellent and new creative direction from Stephen Moffat (who took over from Russell T Davies who is also behind the unbearable Torchwood) has completely reinvigorated the franchise. I used to watch Dr. Who as a pre schooler while my disgusted sister played outside til it was over (she’s never gone for the dorky stuff). After decades, I can finally call myself a fan again.